The Wii U’s Virtual Console offers an excellent solution for playing GBA games on a TV. If you own a Wii U and your favorite GBA games are available, then I highly recommend this method. If you’d prefer to play the games via their original carts, please have a look at how other methods available compare to each other. 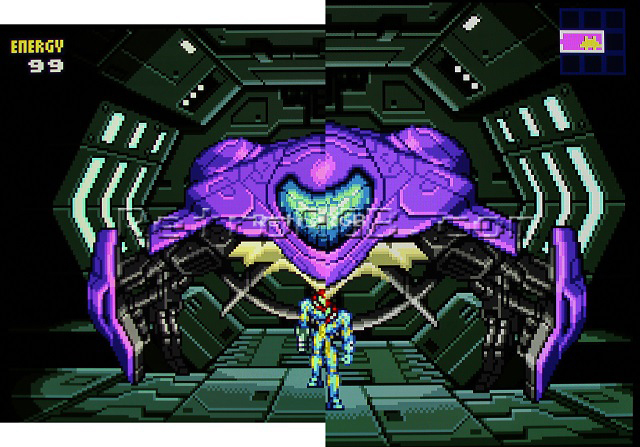 The GBA’s vertical resolution of 160 pixels can be multiplied 4 times to make 640. That means you can run the games in “pixel perfect” mode and they’ll still fill the entire screen. The games might look really good on a high-end CRT, but I’m not sure how they’d compare to 1080p on a flat-screen. Also, the comparison wouldn’t be totally fair, since the GC / GBP can’t output in 16:9. That means a game in 480p mode would still be shown in a “windowed” mode. 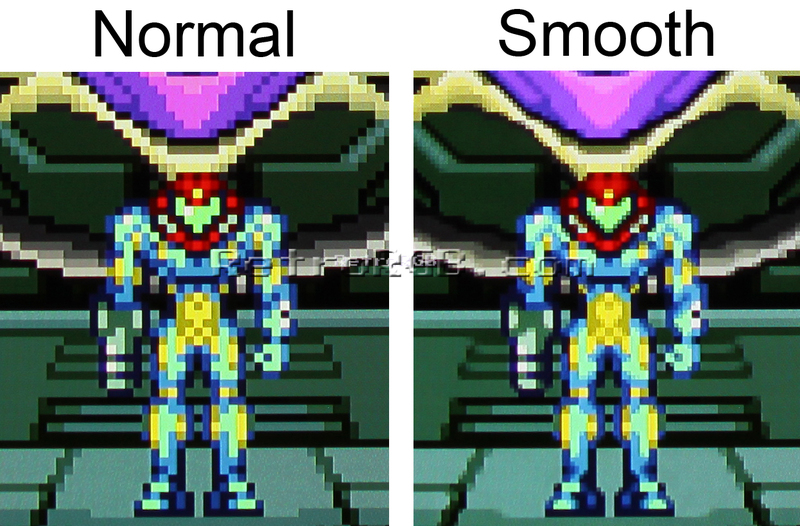 After playing for awhile, it seemed the “pixel perfect” setting was definitely the way to go. It wasn’t much smaller than “fullscreen” and the overall look of the side-scrolling action seemed more fluid. Something to note: If you have a 1080p display, running the GBA game in 1080p “pixel perfect” mode will look much better then 480p…but if you’re using a 720p or 480p flat-screen, try running it in 480p. As stated above, 480p widescreen will fill the entire screen, even in “pixel perfect” mode and (although I haven’t had a chance to test) there’s a chance some non-1080p displays might actually look better running in that mode. Overall, I was really impressed by the entire experience. This isn’t very surprising, as a company called M2 (the company that did a great job on the Space Harrier remake for the 3DS) helped Nintendo work on the project. M2 really goes above and beyond to make the experience feel as close to the original as possible and I imagine that played a huge part in how these games look and feel. This will obviously be a preference for each user, but I (shockingly) preferred playing on my plasma to my CRT! The only thing I felt “missing” is an option for scanlines. 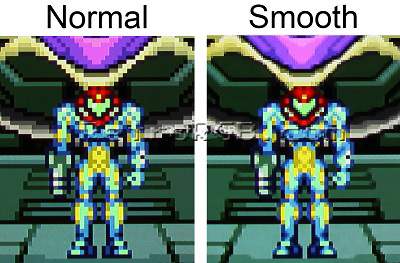 I always wondered why Nintendo doesn’t include this as an option for their Virtual Console games: Not only would it add a nostalgic feel, but the scanlines cut through the pixelation and actually make most retro games look better. Once again, this is a preference for each user, but I think these GBA Virtual Console games look great on both a CRT and HDTV. Please click here to go back to the main GBA page.